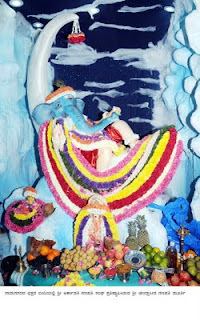 Sri Arkavathy Ganapathi Seva Sanga along with Arali Katte Geleyara Balaga are know to install unique Ganapathi Idols on occasion of Ganesh Chaturthi every year. This year too the idol of Ganapa sitting on moon (Sri Chandraseena Ganapathi) is installed. As usual it is pulling the crowd.